Our flagship beer is a Belgian style blonde, a golden ale with a combination of fruity-spicy Belgian yeast flavor and slightly sweet malt flavor, and dry finish. A lighter version of an IPA, a combination of citrus, grapefruit, mango, pineapple and a slight hint of pine. It is very rich and malty with a bitter hop backbone, but very little hops on the nose. A crisp, refreshing German style Pilsner. Our Maibock is lighter in color than a regular Bock beer, very malty and a slight hop bitterness. At 8.1 ABV it is a nice big beer to start off the summer. Our take on a cup of morning joe. An oatmeal stout brewed with Kenya Coffee from St. Thomas Roasters. A dark stout beer named after the breed of our frost colored farm dog, Icy. This is our highest ABV selection; the round chocolate and roast flavors balance well with the heat of the alcohol. Our version of an American light beer. Very refreshing with a slight hint of hops. Our Winter Warmer is a strong English ale. A malty, roasty brew that is perfect for the cold of winter. A clean and smooth finish Irish Red Ale balancing malt and hops. A classic German style wheat beer with hints of banana and clove in the nose and flavor. Our take on the traditional red wine punch can be enjoyed in any season. This refreshing party drink can be served over ice with a slice of your favorite fruit. This cocktail is made from 20% Boardroom Vodka, 40% Cherry CDR, 40% cranberry juice and glitter. Served over ice and garnished with a maraschino cherry. This cocktail is made from 40% Boardroom Rum, 10% raspberry puree, 10% lime juice, 4% Boardroom Triple Sec, and 46% Raspberry Mello. Served over ice and garnished with a lime. A popular choice among our customers, it is a drier Belgian beer. It has a lightly sweet, refreshing, crisp flavor, with a gentle citrus note. A lighter bodied southern English brown ale. Smooth, malty sweet and roasted, with chocolate and toffee on the nose. A slightly richer and maltier lager, dry in finish, golden in color. ​in French oak wine barrels. ​fermented with Cabernet Sauvignon juice. Our Saison Ale aged for six months in French Oak wine barrels. 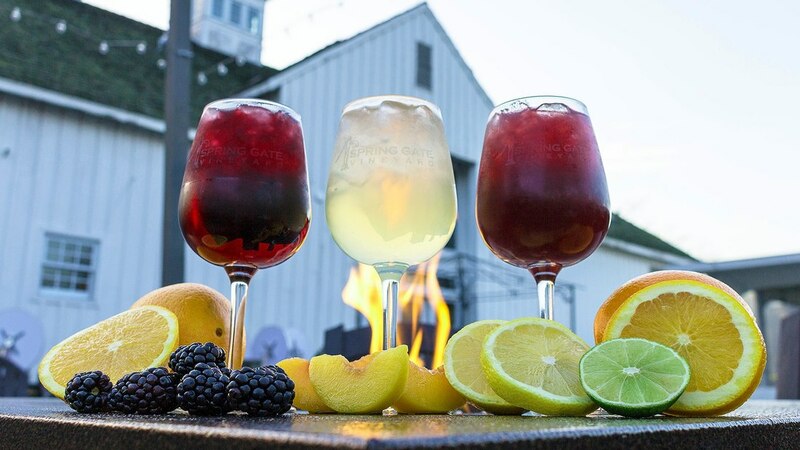 For additional event information, check out the SpringGate Vineyard website here. 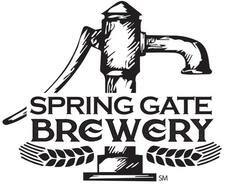 Music, Festivals, Feasts, and Themed events are always on the schedule at Spring Gate. You can find the twelve month outlook, here. ​Festival Cocktails! They're new and unique for each festival at the Brewery. Join us as we celebrate the juicy, plump raspberry at our Raspberry Festival over two days, Friday and Saturday, April 19 and 20! Enjoy all of our libations of wine, beer, cider, wine slushies, cocktails, and SpringShine. Our still Raspberry Mello will be on special for $10 this week. As always, some of our favorite food trucks will be on site and there will be live music. There is no entrance ticket and everything is a la carte. The festival begins at 3pm on Friday; 12 noon on Saturday. Click on the image below to find a printable version of our flyer listing 3-months of events. Buy tickets for trivia by clicking here. 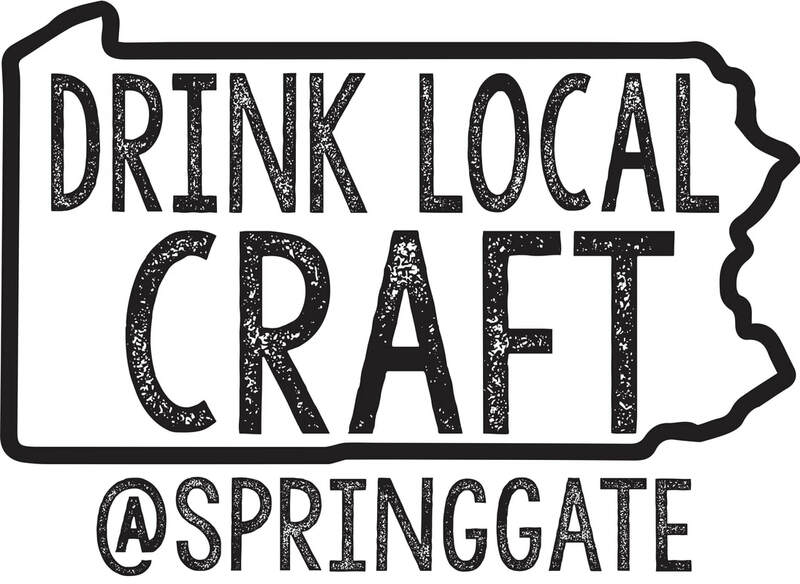 If you use Uber on Saturday and/or Sunday this weekend to get to and from SpringGate, we have a special discount for you. When you arrive, ask someone from Traffic to stamp your hand, then show your server who will explain the discount. See our Music Calendar here, ​and a list ​of our musical guests here. We are a family owned Pennsylvania Farm Brewery, operating on a 250 year old homestead that includes everything from its original log cabin to a one room schoolhouse. From a crystal clear spring, first frequented by American Indians and then the European Settlers, and our hop garden, we intend to produce truly local farm beer in a setting that is unique, restful, and inspiring to share with family and friends.